All the way from the Sargasso Sea – this year’s glass eels have arrived into the Lower River Shannon in Limerick City! We recorded glass eels in kick samples taken during early January 2017 in the freshwater-tidal stretch of the River Shannon in Limerick City. 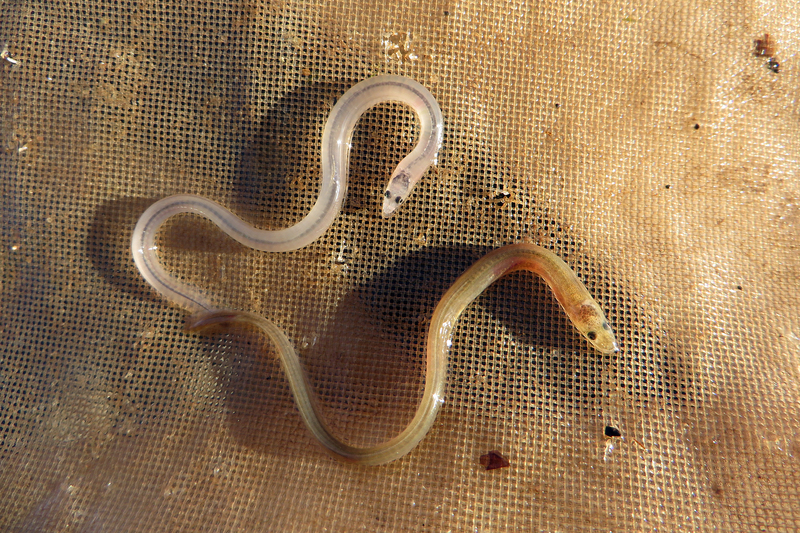 These eels have just completed a c.6,000 km journey from the European eel’s spawning grounds in the Sargasso Sea. The European eel is currently listed as a critically endangered species. It is thought that eel larvae (leptocephali) are carried to the shores of Europe on the gulf stream and that they make this journey across the Atlantic ocean in less than a year. The leptocephali metamorphose into glass eels on the continental shelf before migrating to coastal areas. They then use spring flood tides to passively transport themselves upstream through estuaries like the Shannon estuary. When they reach the tidal head they undergo physiological changes to adapt to freshwater and then hide and wait until the spring when they commence their active upstream migration as pigmented elvers. It is likely that the glass eels found in Limerick during January 2017 arrived in Limerick with the new moon tides of December. Glass eels have been previously recorded arriving into the Shannon estuary from December onwards and may even arrive earlier than that. 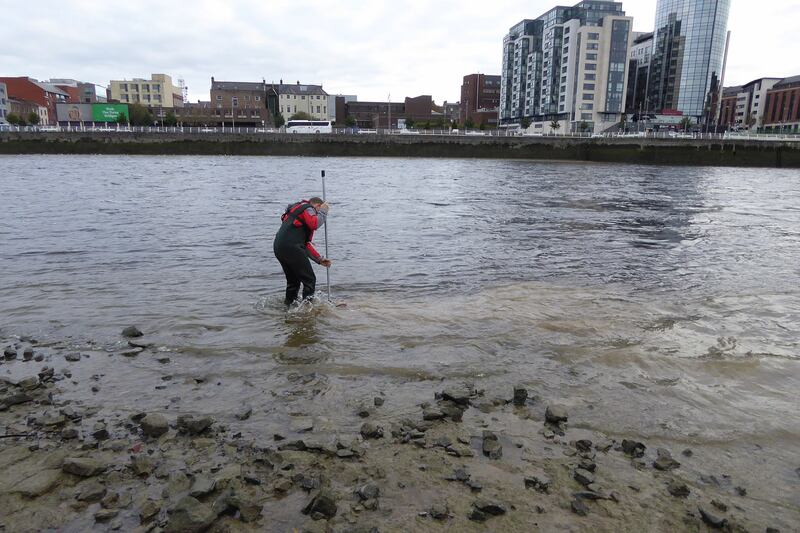 Kick sampling in the River Shannon in Limerick City. Glass eel and pigmented elver from the River Shannon in Limerick City, January 2016. However, these juvenile eels face many challenges. The upper reaches of the Shannon estuary have been highly modified for flood protection and navigation. Many of the creeks, salt marshes, creeks and wet woodlands that once lined this area of the river have been removed and the river has been dredged and modified. This has significantly reduced the habitat and refuge areas for juvenile eels as they wait for water temperatures to rise. With fewer places to hide until spring the mortality rate for these eels is thought to be very high. They have many predators, such as gulls and other fish (e.g. slob trout and other eels). Their upstream migration is then blocked by the Shannon hydroelectric scheme and other weirs on tributaries. The ESB operate a ‘trap and transport’ scheme for elvers at Ardnacrusha and Parteen dams. However, the efficiency of this scheme is very low and many elvers never find these traps. It is noted that the ESB are planning to upgrade their elver trap at Ardnacrusha hydroelectric station in time for the 2017 elver run – and this is a very welcome development. However, it will be necessary to assess the catch efficiency of this new trapping effort and it is not clear if trap and transport of elvers can ever be as effective as restoring migration pathways. Monitoring of recruitment accurately is fundamental to implementing effective management of this species. Timed kick/sweep net sampling at low tide has good potential for use as a method for monitoring glass eels/elvers. We have selected a number of sites around the Shannon estuary where this method could be employed as part of community /schools citizen science project which would contribute significantly to monitoring of juvenile eel recruitment in Ireland. We would very much like to see a project like this funded on the Lower River Shannon. See the video here demonstrating how juvenile eels can be sampled with kick sampling. There is little doubt that the Shannon estuary could have a sustainable glass eel fishery to rival the one on the River Severn. In the 1990’s a pilot-scale glass eel fishery was operated in the Shannon estuary with three two-person fishing crews. An annual catch of 400-500kg (1.2 – 1.5 million glass eels) was maintained over the three years using a small number of nets at a limited number of sites. The fishery was scalable with hundreds of available fishing sites in the Shannon estuary. If we wanted to optimise management of these eels we would have a conservation glass eel fishery catching glass eels and using them for restocking. A conservation glass eel fishery has the potential to significantly improve the recruitment of juvenile eels to the River Shannon catchment by catching and restocking glass eels which would otherwise die. A conservation glass eel fishery would also provide extensive scientific monitoring data, and could be self-funding. For further reading on glass eels in the Shannon estuary / Lower River Shannon see this document ‘Immigration timing and activity rhythms of glass eels in the Shannon estuary in relation to temporal and environmental factors‘ and also the post entitled ‘Millions of glass eels in the Shannon estuary‘. For further information on eels please do not hesitate to contact Dr. William O’Connor at +353 61 419477 or at william.oconnor@ecofact.ie.